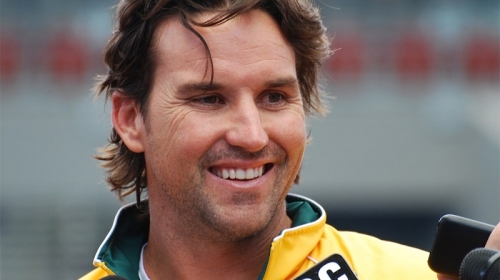 Tennis ace Pat Rafter has become one of Australia’s favourite tennis heroes. Two-time Grand Slam champion – Rafter began playing tennis in outback Queensland, Mount Isa at the age of five and has a genuine and heart-warming story. He is without a doubt one of our greatest and most loved Australians. Rafter’s first attempt to get into the Australian Institute of Sport was unsuccessful, but he wasn’t deterred. He began to play professionally in 1991 and his first acknowledgment came in 1993 when he was named ATP Newcomer of the Year. He then had a string of achievements to follow, including in 1998, being the first Australian to be ranked in the top five back to back seasons since John Newcombe in 1973-74. To then take over number one in the world position in 1999. In 2000 Rafter reached his first Wimbledon finals defeating Andre Agassi, and again in 2001 in the semi finals to reach the Wimbledon finals for the second consecutive year. However Rafter never walked away with the trophy. Pat Rafter said the greatest honour of his career was winning the Australian of the Year award in 2002. “World ranking’s and Grand Slams have been important to me, but I consider being named Australian of the Year to be the highlight of my life so far,” said Rafter. Having said this, Rafter has experienced many career highlights including his back to back victories at the US Open in 1997-1998. Rafter has captured a total of 11 singles titles and 10 doubles titles in his career. Climbing his way to the top of the world ranking hasn’t always been easy for Pat – struggling with a number of serious injuries and in 1996 he was forced to sit out more than three months of the circuit with recurring wrist and ankle problems. In addition to Pat’s commitment to tennis he also is an avid environmental campaigner, being the official spokesman for Coastcare, an Australian organisation funding community groups to care for local beaches, and the founder of the Cherish the Children Foundation established in 1999. This earnt him the ATP’s Arthur Ashe Humanitation Award and he has also won the Stefan Edberg Sportsman Award four times. Pat is now enjoying life with his wife Laura and their first son Joshua. Rafter’s contribution to the sporting world will be long remembered. The third youngest of nine children, Rafter was born in a tight-knit family in rugged outback Queensland. From the most humble of beginnings, he rose to the pinnacle of his sport and left his mark, which will remain strong. Pat Rafter’s is a motivating story that you will never forget. Patrick Michael Rafter, was born in Mt Isa, Queensland on the 28th December 1972. Pat’s interests away from the tennis court are surfing and golf. Pat’s favourite Rugby League team is the Brisbane Broncos and he supports the Brisbane Lions in Aussie Rules. In 1993 he was named the ATP Newcomer of the Year. In 1997, He received Diploma of Honour by the International Committee of Fair Play, for gesture of fair play that may have cost him victory. During January 1997 tourney in Adelaide, reversed a line call in second set tie-break to virtually hand the match to his opponent. Pat won his first US Open Grand Slam and became the first Aussie to win this open since John Newcombe in 1973. He earned the ATP Most Improved Player of the Year award and the Stefan Edberg Sportsmanship Award. He also received the Australian Sports Personality of the Year Award in 1997 and the Media Sports Personality of the Year Award. In 1998, he defended his title by winning the US Open, becoming the first Australian to win back to back US titles since Neale Fraser in 1959-60. Pat was awarded the ATP Arthur Ashe Humanitarian Award and the Queensland Young Achiever Award. He was also awarded the Honorary Ambassador for Queensland and was presented with the keys to the City of Brisbane. The Stefan Edberg Sportsmanship award was again awarded to Pat in 1998,2000 and 2001. In 1999, Pat won the Australian Open Doubles Title with Jonas Bjorkman. On July 26 1999, Pat became the first Aussie to reach No 1 since John Newcombe. He received the Australian People’s Choice Award for Male Sports Star two years in a row being 1998 and 1999. The Patrick Rafter Cherish the Children Foundation was officially launched in February 1999, when Pat donated his Australian Open earnings. His sister Louise runs the Foundation. The Foundation is aimed at giving assistance to kids wherever they need it. In 2000, Pat won “The Bill Brown Community Award” – In recognition of Sporting Achievements and Service to the Community. In 2000 and 2001 Pat was a finalist at Wimbledon. Pat retired from tennis at the end of 2001. In 2002, Pat was named Australian of the Year, and was inducted into the International Tennis Hall of Fame and the Sport Australia Hall of Fame in 2006. Since retiring from Professional Tennis Pat now enjoys spending time with his family. He devotes his available time to his charity “Cherish the Children Foundation”. Pat is now an Ambassador for Bonds, Dunlop, Tennis Australia’s Hotshots program and the Queensland Governments Eat Well Be Active campaign.